A gangway connecting the Queen Mary 2 to a dock collapsed Saturday as dozens of people crossed it to visit what will be the world's largest passenger ship. At least 13 people were killed and 32 injured, as victims fell nearly 50 feet, fire officials said. The victims were family members of workers on the 21-story-tall ocean liner, which is dry-docked at this Atlantic coastal shipyard for finishing touches before its maiden voyage, planned for January. The relatives had been given permission to tour the ship Saturday. As they crowded onto the gangway, the structure collapsed, said Herve Malherbe, chief aid at the Loire-Atlantic prefecture. Victims fell 30-50 feet to the ground. Ten of the injured were in serious condition, according to the Operational Center Fire and Rescue Center. Rescue workers had said one child was among the injured, but they later retracted the statement. French radio reports said several children were hurt. Dozens of firefighters and rescue workers rushed to the scene of the accident, setting up medical units to treat the injured. There was no immediate explanation for the collapse, which came a day after the gangway was installed, especially for the relatives visit. There are other passageways to the ship. Philippe Bouquet-Nadeaud, the shipyard's head of human resources, said the work was carried out by a company specialized in scaffolding for boats. The 150,000-ton trans-Atlantic liner has had its first two test runs, most recently in September. It is to make its maiden voyage from Southampton, England, to Fort Lauderdale, Fla., in January. President Jacques Chirac, lamenting the deaths, was to visit the shipyard on Sunday. Social Affairs Minister Francois Fillon was paying a call Saturday night. Britain's Cunard Lines, which operates the vessel and is owned by Carnival Corp., sent sympathies to the victims' families. "Our thoughts and prayers are with their friends and relatives at this time of sorrow," said the president and chief operating officer Pamela Conover. A Cunard spokeswoman in Miami, Julie Davis, said the company did not know yet whether there would be any delay in the Queen Mary's schedule. "To the best of our knowledge, the ship will sail Jan. 12, as scheduled," she said. The inaugural voyage is sold out, and the whole season of sailings was opened to booking in August 2002, so many reservations have been made, she said. Once completed, the $800 million QM2 — the world's longest, tallest and most expensive passenger ship — will feature a planetarium, 22 elevators and the world's largest floating library. It will top an illustrious list of massive passenger ships. The Queen Elizabeth 2 — whose trans-Atlantic route will be taken over by the new ship in April — was built in 1967; the original Queen Mary was launched in 1934 and is now a hotel in Long Beach, California. In sheer size, the QM2 tops them all. It's 377 yards long and 79 yards high — or about the height of a 21-story building. 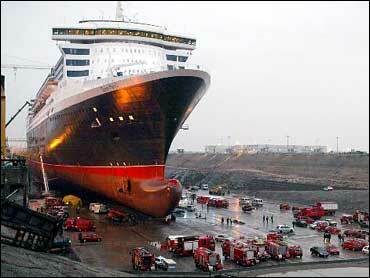 It will weigh more than twice the QE2's 70,000 tons. Royal Caribbean Cruises Ltd.'s Voyager-class ships, about 138,000 tons, are currently the largest cruise ships in service. The QM2 is being built by Alstom Marine's Chantiers de l'Atlantique, and some 800 companies, mostly French, have been involved in the construction. The QM2 has generated a lot of interest, with Chantiers de l'Atlantique saying it had received at least 150,000 letters from people asking to come aboard for a look.